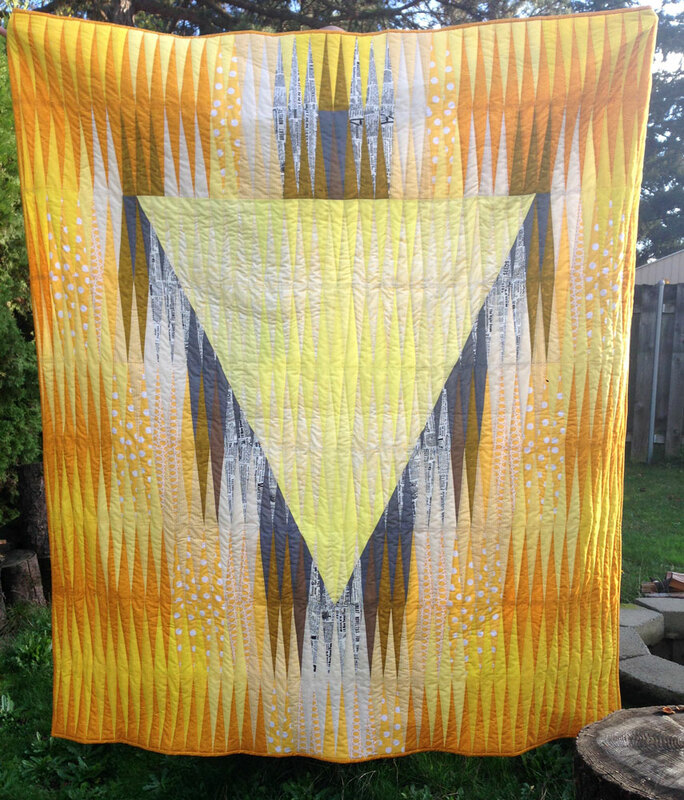 I was able to get a good photo of my Manipura quilt this week and I’m so thrilled with the results! See the difference? Wow! Lighting is very important – indirect is best, and having a stand to keep things flat really helps too… and a good camera! I’m lucky I have a friend who helps me with all this, because people only look at photos when they pick quilts for quilt shows – so it really matters that it looks as good as possible. I was doing my nightly yoga practice and a thought popped into my head. It was the realization that it has been 30 years since I’ve seen or talked to any of my 3 younger sisters. I was kicked out of the family home due to religious differences, and they have avoided me ever since. This thought brought me to tears. I cried through my whole yoga routine, it was a deep, ugly cry – you know the type – where you wake up the next day with a puffy face and tired body – that kind of cry. I knew I needed to process these intense emotions, and I thought of making a quilt, of course. 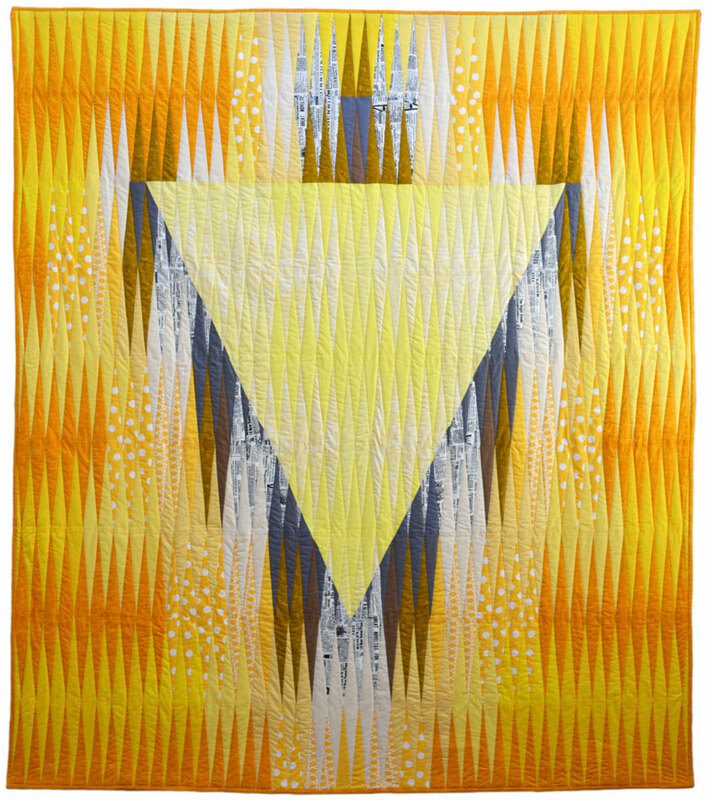 For the next few weeks, I started dreaming about yellow quilts. Yellow fabric, yellow thread, wearing yellow, eating bananas, sewing in the sunshine… all yellow and bright. I also knew I wanted to use triangles to symbolize 30 years / 3 sisters. While these thoughts were bubbling around in my head, I saw my massage therapist who told me about the Manipura Chakra which governs our self-esteem and uses an inverted yellow triangle as its symbol. It also governs all the physical organs that are giving me health issues. That was all I needed to be motivated to create this design! I am confident in all that I do. I am successful and release my creative energy into this reality effortlessly. I would say this quilt is my statement of independence from both the prescribed religion and family I was born into. I have found myself, my people, and my spirituality all on my own and this quilt reflects that nicely. Quilting for therapy is probably the best thing I’ve ever stumbled upon… it’s such a great way to process emotion: cutting pretty things apart, then putting them back together to create something completely new and beautiful in a different way. It is so much better than the way I use to deal with emotions, which was to drink them away. Now I have something to show for my time instead of daily hangovers! Gail, this quilt is wonderful and I think you’re so brave for sharing it and all the details with strangers (and friends!) on the internet. Glad you have an excellent picture of it too. I hope things are going better for you. I just came across this post linked back from the image of the quilt. Gorgeous work! I love it. It has been made from the heart and it shows through. I cannot fathom being alienated from family and really applaud your courage. I respect that you have chanelled your emotions in such a positive manner.